Time for a Big-Kid Bed! Mia continues to grow, poco a poco…and although we might not always notice the day-to-day transitions, the milestones such as this are the ones that make me realize how quickly we’re growing a person. 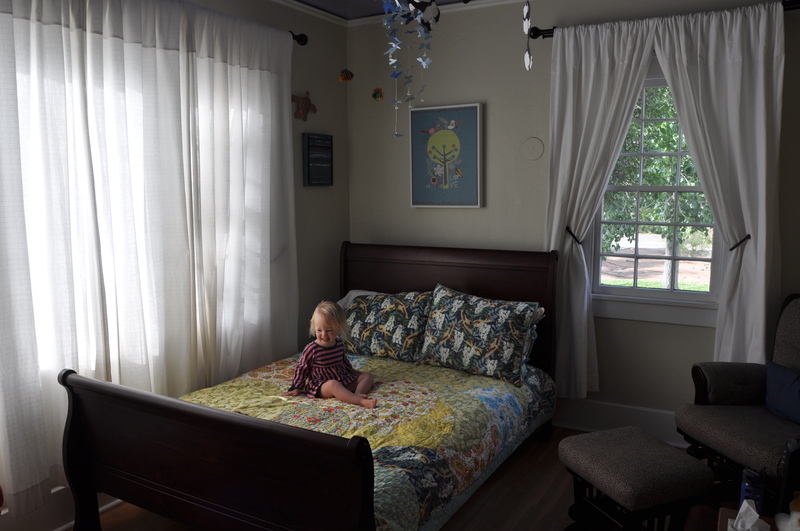 We’ve just bid farewell to our beloved Stokke crib and changing table, and upgraded to the next phase: a Big-Kid Bed! Bye bye, crib! Thank you for many sweet dreams! I clearly recall the many, many hours we spent researching the “perfect furniture” for our growing Little Bean. 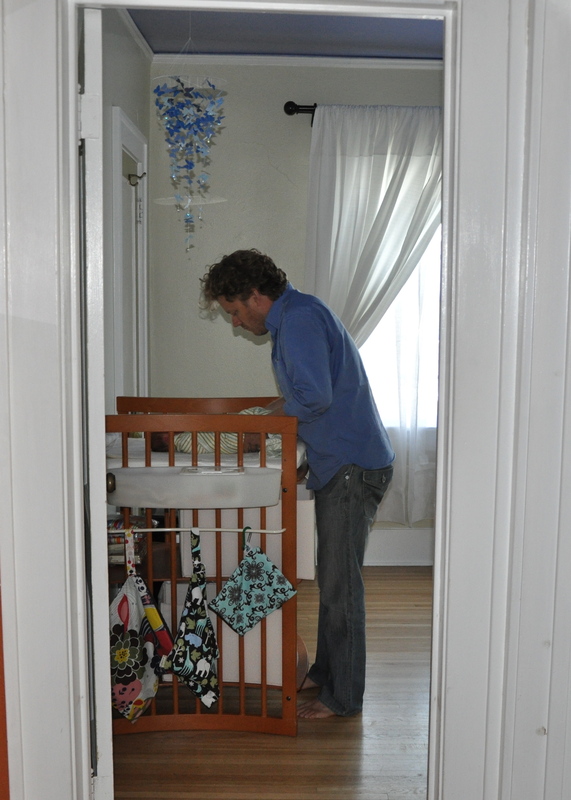 I remember watching Aaron assemble that elegant crib and changing table. I can easily conjure up images of Mia, just days old, sleeping in her bassinet, in our room, right next to our bed (the mini-crib fits anywhere and can be easily rolled through doorways). I remember many of the milestones of her first few years of life, as they related to that crib: the day we transitioned her crib from our room to her own room, and how it seemed like she was miles away even though it was only a few steps; the day we expanded the mini-crib to the big crib; the day she almost climbed out and I realized we had to lower the mattress; the day we took off the panel to transform it to a toddler bed that she could climb into and out of it all by herself (!! ); and, more recently, the day we started talking about a big-kid bed. Post bath, on changing table. Mia loves bath time. October 10 to February 10: Almost time to convert the bassinet to the crib! 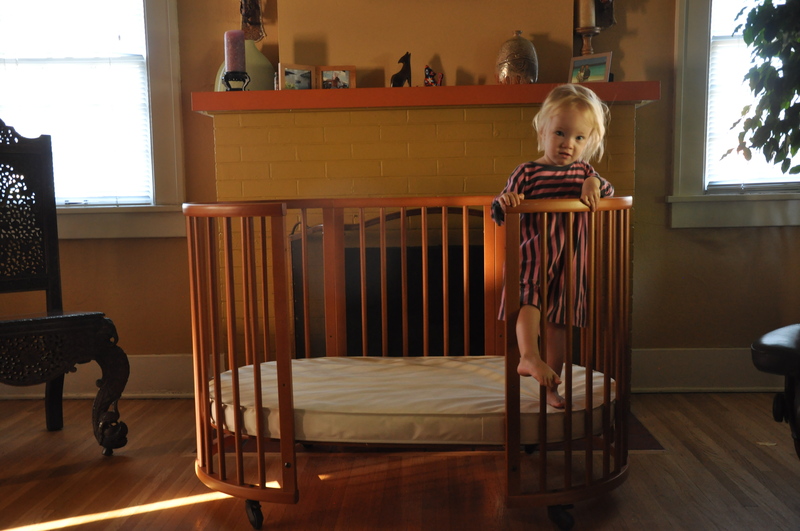 Being sentimental about a crib…ok, that is understandable. But a changing table, really? Yes, really! (This pic of Papa/Diaper Master with our one-day old daughter brings tears to my eyes every time I see it.) Not just any changing table but this changing table: First of all, it allowed face-to-face contact between us and our child (rather than having to do those side-ways bottom-wipes with baby laying perpendicular to parent…who came up with that idea?). As all parents do, we spent a lot of time changing diapers and singing songs, looking up at butterfly mobiles, and bonding at that table! Eventually Mia began to view the changing table as an indoor jungle gym…by then, it was already on its way to being obsolete in our household. We’ve been done with the changing table since November 2014, when she was just over two years old. And once we started noticing her feet and legs sticking out of the crib, we started talking about the next steps (note that IF she slept right in the middle and didn’t squirm, no parts would extrude, but I have yet to meet a toddler that follows that protocol!). Because we were and continue to be so very pleased with Stokke, the first thing we considered was their “toddler bed conversion kit”, which allows the crib to be expanded into a toddler bed; although that option would retain the same cozy feeling of the mini- and crib, it would still be pretty small and definitely too small for Mama or Papa to sit in bed with her. Other cutesy, themed toddler beds just aren’t our style plus they are too small. We considered a twin bed, but those aren’t much bigger so we figured we’d end up upgrading/expanding to a double bed pretty quickly. So we decided to go straight to a double (or full) bed. We started looking for cool antiques but it was hard to find exactly what we were looking for and we had concerns about funky chemicals needed to restore an old piece of furniture. (Of course, I am concerned with harsh, toxic chemicals and this is even more important for beds, especially your child’s bed. Just think of how much time they spend in bed: Mia spends 12-14 hours per day sleeping!!) So after much searching, we settled on this sleigh bed. It is big, beautiful, and she loves it. Now for the most important part, in my opinion: This lovely bed will last a very, very long time! (I can’t resist a teeny environmental plug here: selecting/buying quality products — and taking care of them, of course — lessens your environmental impact.) Nothing like a child to encourage the Acquisition of Stuff…but there is always reason for hope!! This entry was posted in Acquisition of Stuff, Family, Mia and tagged bed, crib, furniture, toddler. Bookmark the permalink. 1 Response to Time for a Big-Kid Bed!